There are machines and there are machines. Some make you gasp in awe, some make you swoon with envy and then those which just steal your heart. We were invited on-board the first ever track day of this track ready DUCATI PANIGALE V4, piloted by (Owner) Ashutosh Mahadik and boy, what a pleasure it was for our boys to be there in the thick of it with our favorite rider, going toe for toe in the blistering heat, humidity and uncertain weather! 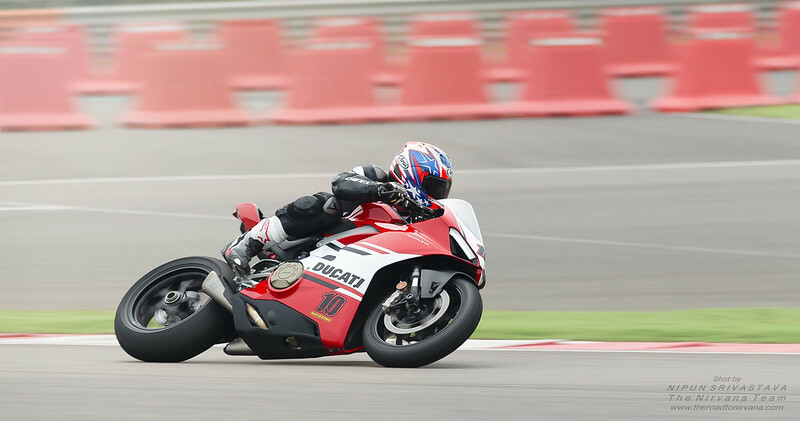 The Ducati Panigale V4 speeds out of the first curve at Buddh International Circuit in India! ‘A new opera.’ That’s how Ducati opens its marketing pitch for the Panigale V4. With the Akrapovic full-system performance exhaust on this particular unit, there sure were a whole new set of notes ringing around the Buddh International Circuit! Spine tingling sound is one thing, the 1 to 1 power to weight ratio has this machine belting out over 225 BHP! 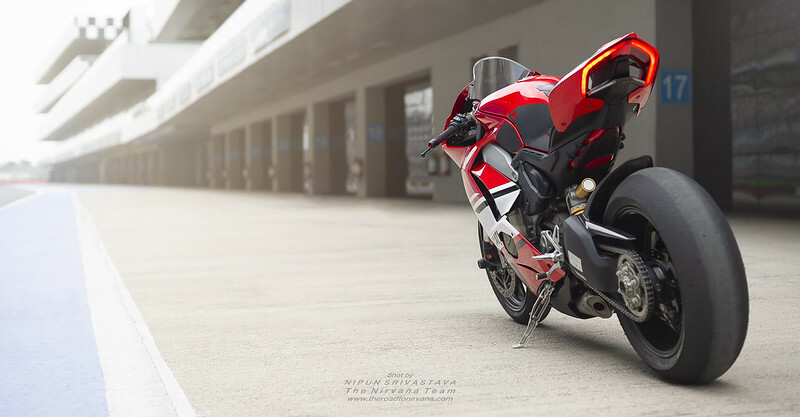 To see this symphony in motion is to see the pinnacle of the Ducati Design team’s strongest performance yet. “The beauty of this machine is in its handling. That’s what owner, Ashutosh has to say about the motorcycle after his first few track sessions. Ashutosh, taking all the V4 has to give! The new range toppers for Ducati’s supersport line of motorcycles, the Panigale V4, V4S and the V4 Speciale replace the older Panigale 1299. They say it’s the closest you can get to a Moto GP motorcycle for your money. Well, from the track-side production pillboxes on the Buddh International Circuit, we could only nod in agreement as we saw the V4 zip by with its Akras screaming in automotive ecstasy. “The Italians consistently create designs which make my heart sing, whether it is their supersports, scramblers or even the multistradas. They know exactly how to take a great design and elevate it to the next level. Every. Single. Time. Such a stunner – the new V4! 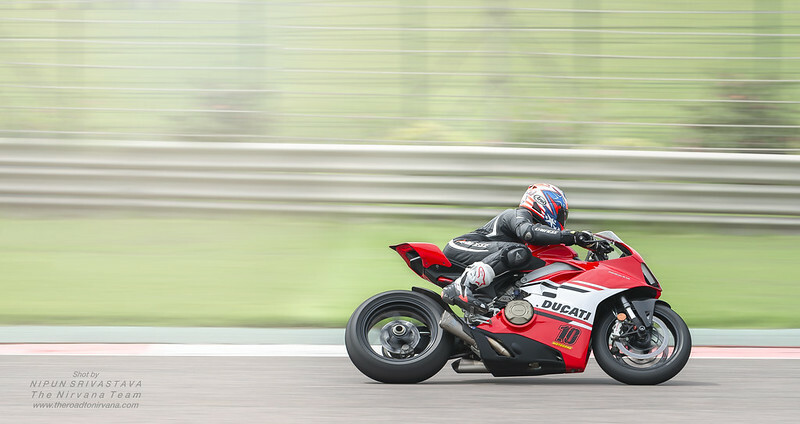 Ducati reigns on the BIC! Well, here’s wishing Ashutosh a million more miles on his wheels! Cheers to your spirit man! The Nirvana Team & www.theroadtonirvana.com, now offer bespoke photo/video-sessions at the BIC for enthusiasts looking to create a portfolio of their Racing Lifestyle at the Buddh International Circuit. These photo-sessions include: 1. A rider profile 2. A motorcycle profile 3. Track riding images 4. Specific images requested by riders (e.g Knee/Elbow Down, Body Position images) 5. Racing Lifestyle Images. Be the star of your own story! Email us on hotshots@theroadtonirvana.com for enquiries. This entry was posted on September 12, 2018 by Nipun Srivastava. It was filed under Photography .